Don’t Ever Take This Away From Your Patients. I know after reading many of my blogs you know I am a big lover of customer service and the patient experience. I am always looking for excellent customer service ideas to share with the dental profession so they can use them in their dental practices. But I need to say this to everyone. Once you start implementing customer service ideas in your business and you see they are working, you must continue using them with your patients. The first reason is because offering customer service and an excellent patient experience that is working, means your patients are enjoying the service you are providing and keep coming back to you. If you stop giving your patients the customer service they have grown to expect and enjoy, they will feel you now don’t care about them. If you celebrate your patient’s birthdays with a card then please don’t stop sending that card. Your patient now expects and enjoys that care you show. I just don’t get why this happens, but I see it a lot in many businesses. You give your customer a particular service then all of sudden that service is no longer available to them. This consistent patient care is a big part of why your patients return to you for further care and treatment. Why would you remove this? True customer service is about being consistent and never letting your patients down with their expectations of what you offer them. Your patients will notice the removal of customer service straight away and it will be the difference between them going elsewhere for their dental care and treatment. Set up systems for your patient experience and customer service. Make the patient experience about something other than their dental care. After all every one of your patients is a person wanting to be appreciated and thanked on a regular basis. Don’t be like the rest of the Dental Profession and not offer customer service to your patients and don’t start giving great customer service and then take it away! 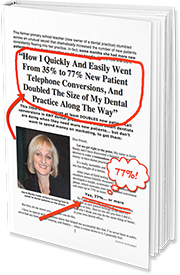 My next public speaking event is my live full day Master Class “How to Turn Every Dental Phone Call Into A Valued and Kept Appointment” and is being held in Brisbane on Friday April 6th 2018. Click here for information on Sydney and the Gold Coast. Hi Jayne, I’ve been running my dental practice in Bondi Junction for close to three years. I’d like to find out more about your ideas in the area of customer service improvement. I’m sure my staff would benefit from that as well. Look forward to hearing from you.